Temke is one of the best places to visit in Bhojpur district. Temke is surrounded by dense jungle and rocky mountain. 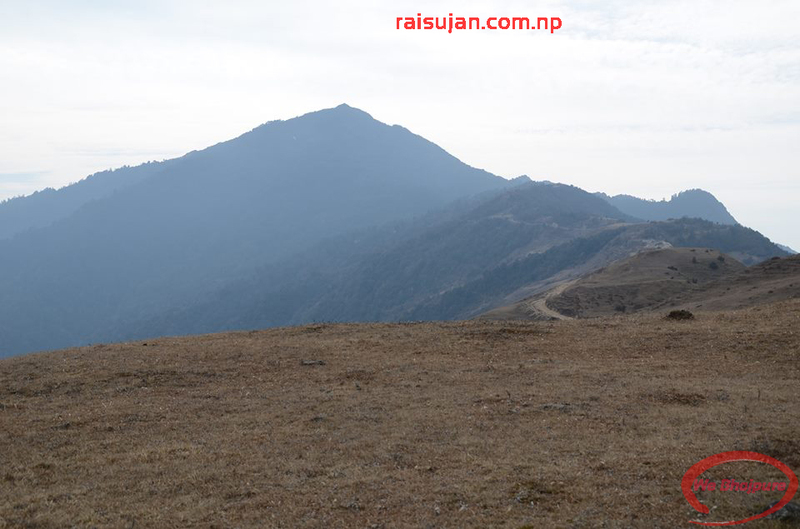 It lies on the North side of the Bhojpur headquarter, Temke hill is situated on the border of Khotang and Bhojpur district. It is situated at an altitude of 3032m above sea level. It is a place of natural beauty where everyone becomes spellbound by its enchanting beauty. Its magnificence captivates everyone whoever reaches there. This place gives us the feeling of an enthralling lifetime experience, where it is a beautiful heaven in itself. We can see blossoming rhododendron, Sunakhari, Chimal, Ghede-Chap, Chap (types of flower) etc. all over Temke jungle. We can see beautiful panoramic views of the Himalayan range, Terrain, Mountain and sun rising scene. Along with that, you will also be able to witness the unbelievable and the magnificent view of Mt. Everest and other nearby mountains. The most crucial and valuable herbs can be found in this periphery. Around four hours of travel by bus from headquarter, our routeway is crossing Dawa, Timma Rimchim, Chinamakhu, Annapurna and Nagi 4 Kattike and finally Chakhewa. Chakhewa is situated in the lap of Temke. Dhap Dada is the best peak in Chakhewa. We can enjoy by lying down on the barren meadow of grassy land over there. There are motels in Chakhewa to stay, approximately 3 to 4 hours of continuous walk from Chakhewa we can reach the destination Temke hill. Within the walkway, we can enjoy the beautiful scenery of the jungle, water sound, animals, birds, flowers, Himalayan range, dense Malingo (types of bamboo) etc. It really entices the visitors within the travel time by the scenery of Lophophorus (Monal) and peacock, deer etc. Visitors never feel fatigue within the journey. At the Temke peak, there are two temples, one is Shiv and another one is Maheshwor. We can see Maheshwor temple inside the rocky mountain. It is very slope which makes us thrilled and its blown speedy wind. At the top of this peak, there is a pond. There was a belief that long time ago in the pond's edge "there was salt around the pond and when the shepherd visited he tasted the salt cube meanwhile the salt found around the pond vanished." This old adage also makes travellers eager to know more mystery about this place. In this Temke, carnival Mela has been starting twice a year, once in Mangsir Purnima and another in Chaitra Purnima. Many people gather there for offering something to God for the sake of their better lives onwards. They even come for meeting their relatives and spent some moment with them. From different parts of the villages, people come in the carnival to see and perform their magical power of Dhami Nakchhum (witch doctor). The magical power of Dhami really focuses on people's mind toward them. We feel as if a piece of heaven is drop down to earth after viewing this place. This is one of the best travelling destinations for Nature lover i.e. make your trip haunting and unforgettable.